This NASA graphic depicts the orbit (blue curve) of asteroid 2011 EB47, which will pass close by Earth within the orbit of the moon on March 16, 2011, one day after it was discovered. The asteroid poses no threat of impacting Earth. This story was updated at 6:30 p.m. ET. An asteroid the size of a house zoomed by Earth today (March 16), flying within the orbit of the moon just one day after astronomers spotting the space rock in the sky, NASA says. The small asteroid 2011 EB74 was about 47 feet (14 meters) across and posed no threat of hitting Earth, since it was too small to survive the trip through the planet's atmosphere. Instead, the asteroid passed our planet at a comfortable distance of about 203,000 miles (326,696 kilometers) when it made its closest approach at 5:49 p.m. EDT (2149 GMT), NASA officials said. For comparison, the average distance between the Earth and the moon is about 238,000 miles (382,900 km). 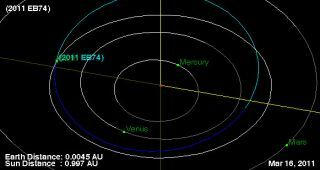 The flyby of 2011 EB74 is about 0.85 Earth-moon distances, officials said. NASA announced the asteroid's close flyby today on Twitter and via an online widget used by astronomers with the agency's Asteroid Watch program. The program aims to share news and updates about asteroids and other near-Earth objects with the public. "At 14 meters in size, 2011 EB74 is NOT considered a potentially hazardous asteroid. Rocks this size would burn up in our atmosphere," Asteroid Watch officials wrote in a Twitter update. The asteroid will likely be extremely hard to spot for skywatchers, unless they are seasoned amateur astronomers and have the right observing equipment, officials said. "These objects are dark and fast, and usually require a sizeable telescope to track," Asteroid Watch officials told one Twitter user. Today's asteroid flyby is the latest space rock to fly near Earth this year. A car-size asteroid buzzed Earth on Feb. 14. A tiny space rock set a new record for the closest approach to Earth without entering the atmosphere when it zipped within 3,400 miles (5,471 km) of the planet on Feb. 4. Like 2011 EB74, neither of those asteroid encounters posed a threat to Earth. NASA astronomers and other scientists regularly monitor the skies to hunt for asteroids or comets that may be an impact threat to Earth. One such effort, which uses a telescope called Pan-STARRS PS1 in Hawaii, set a new record this year when it discovered 19 previously unknown asteroids in a single night on Jan. 29. The Near-Earth Object program at NASA's Jet Propulsion Laboratory in Pasadena, Calif., tracks potentially dangerous asteroids and studies their orbits to determine if they pose a risk of hitting the Earth. The Asteroid Watch program is an outreach arm of that effort. You can follow SPACE.com Managing Editor Tariq Malik on Twitter @tariqjmalik. SPACE.com for the latest in space science and exploration news on Twitter @Spacedotcomand on Facebook.